Chief Deputy Tim Moore began his law enforcement career with the Douglas County Sheriff’s Office in 1990. Promoted to Chief Deputy in 2010, he now serves as our executive officer of Administrative Services. Tim was first promoted in 1996 when he served as law enforcement supervisor for the newly-formed city of Lone Tree. In 1997, he was promoted to sergeant and spent five years as public information officer where he specialized in media relations. Tim was promoted to lieutenant in 2003, and in December 2004, was promoted to captain where he commanded the Detention Division until 2006, and then the Patrol Division until 2010. He also recently completed four years of service as commander of our regional S.W.A.T. team. 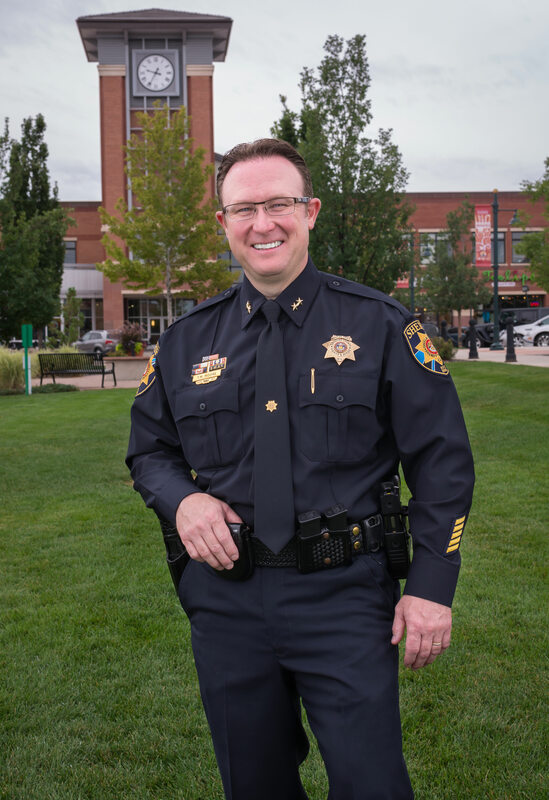 Educated in criminal law and public administration, Tim is also a graduate of the FBI National Academy, the Northwestern University School of Police Staff & Command, and 2005 graduate of the Leadership Douglas County program. Tim is very active in the community where he serves on the boards of directors for the Women’s Crisis & Family Outreach Center and Developmental Pathways. He also routinely speaks at community events about crime trends, crime prevention and reduction, public safety and sheriff’s office operations.